I always enjoy reading about Houston, especially when it comes to how the city developed. I recently came across the 1974 Urban Land Institute's "Houston...Today" report, compiled for the 1974 ULI Spring Meeting. (A full scan of the PDF can be found here.) The brochure incorporated information about major development projects in Houston in 1974, either as being "Downtown", inside the Central Business District, or "Suburban", outside the CBD. Before jumping into highlighting Houston area projects, readers will note the growth in Houston's population, as well as the larger Houston metropolitan statistical area. 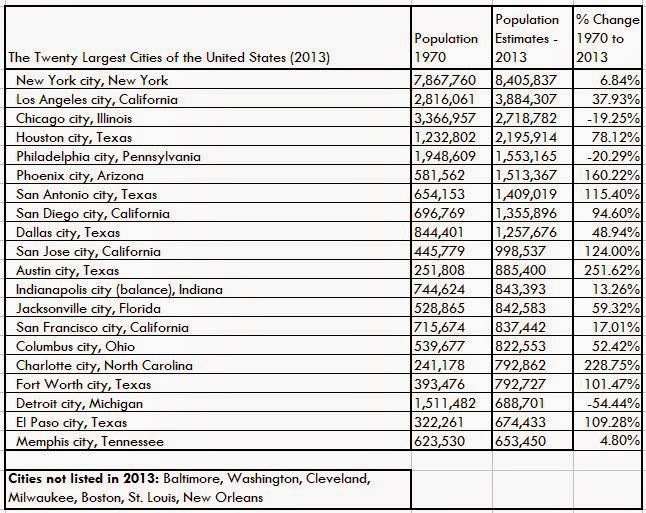 In 1970 Houston ranked as the 6th most-populous city, right behind Detroit. Oh, how things have changed in 40 years. It wasn't much earlier in 1950 that Houston was only the 14th largest city in the country, having not been ranked in the top 20 largest cities at any point before that. Houston's metropolitan statistical area ranked 13th in 1974, and now ranks 7th in the country. "Houston...Today" focuses on the comparison of cities and MSA's between 1960 and 1970, where Houston saw 40 percent growth in its MSA population, and a 31.4 percent increase in its incorporated population. I have included tables below showing the growth of the top 20 largest MSAs and cities from 1970 to 2013. AllenCenter - It was originally designed to include a theater at the corner of Dallas and Bagby, a major retail store and shopping center that would be covered by a weatherproof dome, and what looks like a hotel with a skybridge over Allen Parkway / Polk Street. There was much that never materialized for AllenCenter, but the development helped bring other development to the southwest part of Downtown Houston. The area around the Allen Center has definitely changed since 1974. Allen's Landing Park - There's a debate whether Allen's Landing is really the place where the Allen Brothers, Houston's founders, landed their boats after coming up Buffalo Bayou. Either way, the area was once part of Houston's bustling port, and its name has stuck. Efforts in the 1970's were made to revitalize this lonely park on the north side of downtown, but it doesn't look like it worked. Granted, it is much better than it's previous use: a parking lot / sand pile / gas station site. I have often wondered why Houston's bayoufront is so grossly under developed. It's a bit disappointing that the largest buildings along Buffalo Bayou are jails and Harris County Sheriff buildings. The jails are a little bit different of a residential use than I would image cities would like to have along their downtown waterways. Thankfully, the Buffalo Bayou Partnership and Houston First are in the process of renovating the Sunset Coffee Building, transforming the building "into a recreational and cultural center which will include an outdoor plaza, hiking/biking/boating facility, offices for Buffalo Bayou Partnership, and a rooftop terrace." Downtown Tunnel System - At the time of publishing in 1974, the Downtown Tunnel System only joined about 37 city blocks. The various tunnels in the system were marketed as places that allowed people to be "free from rain, sun, cold, and heat, as well as competing vehicular traffic." Now, the Downtown Tunnel System is over six miles long and connects 95 city blocks. The tunnels are now described as "an amenity for the large office population", so the system is open only Monday through Friday from approximately 6 a.m. to 6:30 p.m. Some argue that developers were smart to develop the network, keeping their employees and others free from the humid Houston summers, which some find painful when having to navigate downtown on foot. But, others, including myself, aren't the biggest fan of the tunnels, and would love to see more street-level retail activity in our city's downtown district. Houston Center - The most interesting entrant in the 1974 ULI brochure is for the Houston Center. The plans for the Houston Center are nothing less than impressive. It is noted as being "the largest development of its kind being undertaken by private enterprise." It was designed on the planning concept of "what a city should be", and utilized the area above city streets. The original plans for the Houston Center called for a "total environment" complete with "high-rise and low-rise buildings, two 1,000 room hotels, 3-5 motels, apartments, commercial facilities, public plazas and building support uses. It was intended to incorporate "all forms of public and private transit, both vertical and horizontal." The most interesting feature of the Houston Center was the planned high-speed, high-capacity loop road surrounding the entire complex, suspended above the existing city street grid. It was intended to increase automobile access to and from the Center, and to completely separate pedestrian and automobile traffic. The Houston Center was to be elevated about 50 feet from street level, and was to have transportation provided by airport-like moving sidewalks (what is this, a Seinfeld episode?) and people-movers. The 3-dimensional transit system of elevators, escalators, moving sidewalks and people-movers aimed at connecting the project, as well as other parts of the city. The Center had an objective to "keep the city alive and functioning at night as well as during the business day", and ultimately was a catalyst aimed at providing living accommodations that would attract residents back to the central city. The projected, mostly low rise, apartment buildings were planned to provide approximately "5,000 apartment and townhouse units to accommodate an ultimate residential population of between 10,000 and 12,000." This is actually about the same number of units that have are being provided by the Downtown Living Initiative from the Houston Downtown Management District/ Downtown Redevelopment Authority. Portions of the Houston Center were built, but ultimately only a portion of the original plan was realized. The failure of the project resulted in much of Downtown Houston's east side still being covered by surface parking lots. Thankfully, the never-realized plan allowed for the later development of the George R. Brown Convention Center, the greatly-loved Discovery Green, and the soon-to-be-built Houston Marriott Marquis Convention Center Hotel. Old Market Square Rejuvenation - It wasn't until 2004 that we got the Market Square that we now know. In 1974 it was used as a parking lot. An excerpt from the brochure notes that "The block on which the present landscaped parking lot called Old Market Square Park exists was dedicated by Houston's founding Allen Brothers for location of a city hall / marketplace." The name of the parking lot alone is a testament to Houston's insatiable need for downtown parking. It's a bit insulting to commemorate a former park by giving a parking lot the same name. It is somewhat like developers typically give subdivisions a name of something they replaced, usually something like "Forest Vista", "Rolling Meadows", or "Strawberry Knoll", a subdivision in my hometown of Macomb Township, Michigan, that was developed from large strawberry fields. There is a stark contrast between the photograph of the Old Market Square Park parking lot and today's Market Square. It is also intriguing to see the comparison of the 300 block of Travis Street, as places such as Treebeards and Char Bar give the block a bit more life than it had in 1974. If all goes as planned concerning the future developments of the 40-story Market Square Tower residential tower and the Hines One Market Square residential tower. If the site of the once-planned International Tower office building is ever developed, there will be developed sites completely surrounding Market Square. (The International Tower has been removed from Downtown Houston's most recent Downtown Development Map) These developments would repair the surrounding area's "broken urban fabric", as described by Christof Spieler in 2008. Westbury Square - Not only can you find examples demonstrating rejuvenation in Houston, but also examples of decline, something all cities face. One of the most notable examples in the 1974 ULI brochure is Westbury Square, and specifically the Westbury Square Shopping Center, the ill-fated commercial development that suffered from the opening of the Galleria. The development's mall could not compete with the Galleria, and most of it was torn down to make way for a Home Depot. It was a development that was almost before its time, providing walkable retail and residential in a city that builds nearly everything around automobile dependency. The apartments that were part of the original development still exist, although now in the form of condominiums. The brochure contains a great deal of other real estate site information, with 77 developments being highlighted in total. Other notable projects include Astrodomain, theGalleria 2, Greenway Plaza and The Woodlands, among others. Houston saw rapid development in the late 1960's and early 1970's, and this ULI Spring Meeting brochure highlighted many of the developments from that time. It is important that we remember the past as we look forward to Houston's development future. As we look ahead to Houston's future, it is always interesting to gain perspective by looking back to see what worked, what didn't, what was planned, and what was dreamed. Hi, my name is Pseudo3D, aka IronTiger on the HAIF. I discovered "Houston Today" several years ago at a university library, and released several scans to the HAIF, most notably for the unbuilt Houston Center (these were later "borrowed" for a blog at the Chron). I had to eventually return it to the library (I had renewed it several times and it was falling apart), and I was unsure I'd ever see it again. Thank you for making it available for everybody! Pseudo3D / IronTiger, you're welcome! It's something I was flipping through and thought it was interesting. Not having grown up here, it's neat to look back and see how things have developed. I apologize for the lower-quality scan. Let me know if I can provide a higher-quality scan of any particular project. Thanks for checking out the blog.